Have you ever wondered how athletes learn and make use of the feedback they are given by their coach, or how a coach could make his or her feedback more effective for athletes? Psychology in Sports Coaching has been written specifically for students studying coaching who want to improve their understanding of incorporating psychology into coaching practice. As such, it provides information on how coaches establish the psychological needs of athletes in order for them to provide psychological interventions, such as mental imagery, mental toughness training and coping effectiveness training. This book also provides the reader with information on enhancing the awareness of athletes and the relationships that occur between the coach and the athlete. It explains how coaches can coach children, adolescents, adults and athletes with learning disabilities. These groups of athletes have different learning styles, are motivated by different factors and prefer instructions to be administered differently. So, it is important that coaches tailor their coaching based on the athlete they coach, as this has the potential to enhance the performance and enjoyment of the players that are being coached. 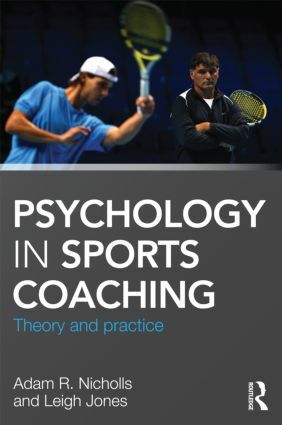 Essential reading for all students of sports coaching and sport psychology, and for practising sports coaches, this book will help develop and extend coaching expertise.